Thursday July 2nd 1896 Will was in bed all the forenoon but cut wheat in the afternoon. I cleaned up the cellar and store room in the forenoon and worked on a mat in the afternoon. 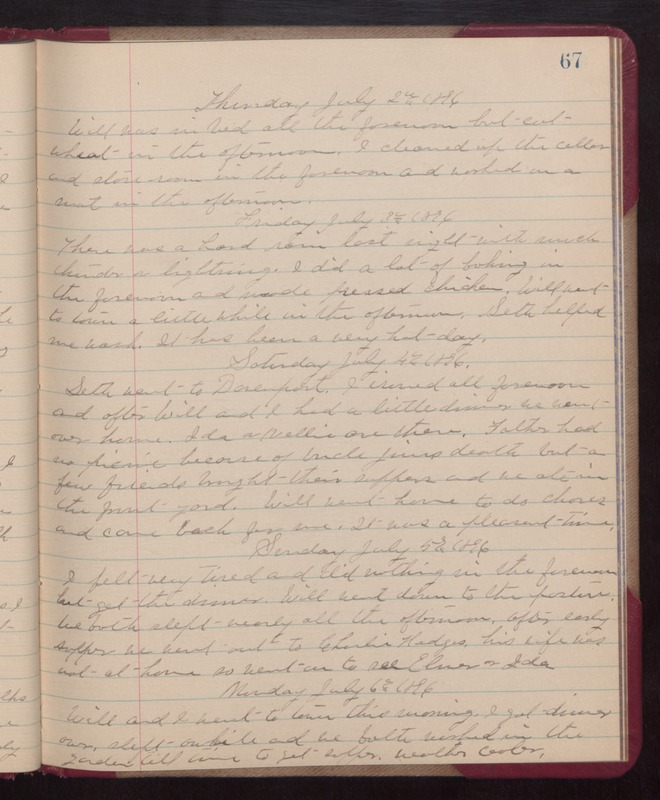 Friday July 3rd 1896 There was a hard rain last night with much thunder & lightning. I did a lot of baking in the forenoon and made pressed chicken. Will went to town a little while in the afternoon. Seth helped me wash. It has been a very hot day. Saturday July 4th 1896 Seth went to Davenport. I ironed all forenoon and after Will and I had a little dinner we went over home. Ida & Nellie are there. Father had no picnic because of Uncle Jims death but a few friends brought their suppers and we ate in the front yard. Will went home to do chores and came back for me. It was a pleasant time. Sunday July 5th 1896 I felt very tired and did nothing in the forenoon but get the dinner. Will went down to the pasture. We both slept nearly all the afternoon, after early supper we went out to Charlie Hedges, his wife was not at home so went on to see Elmer & Ida. Monday July 6th 1896 Will and I went to town this morning. I got dinner over, slept awhile and we both worked in the garden till time to get supper. weather cooler.